For the Hollis Brookline wrestling team, the highest of highs has been reached and yet there is still more to be done. The two-time defending Division II champions, the Cavaliers return a trio of individual champs. Senior Jonathan Lopez (113 pounds) will anchor the lower weights while sophomores Zach McPherson (132) and Caleb Lomme (145) will look to dominate their divisions for years to come. HB also returns three wrestlers who finished in the top four. As a team, HB was fourth at the Meet of Champions. 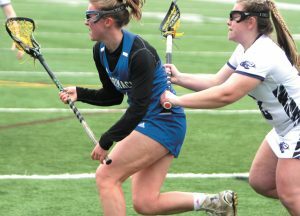 Expect to see Milford and Merrimack in the mix as well in Division II. The Spartans return seniors Scott Danewicz (170) and Devin Dolliver (138) who both finished second at the D-II meet. The Tomahawks return six wrestlers who finished in the top six including Ben Cronin (120) who took a third last year. Alvirne returns juniors Taylor Thyne (113) and Evan Manning (182) who both finished third last year. As the defending NHIAA bowling champion, the Souhegan team clearly has a target on its back. It is not the only local team with lofty expectations, though. Merrimack and Hollis/Brookline, the NHIAA champion only two seasons ago, also look to be particularly strong heading into the season. “Every team is very good, well coached and competitive,” Souhegan coach Timothy Frye said. The Sabers will bring back only two starters from their championship team, but early showings by some of the newcomers have been positive. Frye is also counting on the persona of past teams to continue on to the 2013/14 squad. The Hollis Brookline team is only one season removed from being the defending champs. While last year’s quarterfinals elimination may have been disappointing, returning the majority of last year’s squad should lead to more success. COACH: Brian Bumpus, fifth year. 2013 finish: Division II title. RETURNING STARTERS: Austin Pigott, sr.; Joe Spohn, sr.; Leo Lorden, jr.
OTHER RETURNING LETTERWINNERS: Grant Johnson, sr.; Steven Glover, jr.; Kathryn Bobek, jr.
COACH: Bob Murphy, fifth year. LAST YEAR: 13-6, lost in preliminary round. RETURNING LETTERWINNERS: Sydney Gillis, sr., guard; Jenna Hyatt, sr., guard; Michaela Dowling, sr., forward; Lindsey Beauregard, sr.; guard; Celeste Marsan, jr., guard. PROMISING NEWCOMERS: Bri Hackett, sr., guard; Cassandra Stapelfeld, fr., guard; Kristen Dupont, jr., forward; Kristin Johnson, jr., forward; Ashley Skey, jr., forward; Gabby Pickard, jr., forward; Maddy Snow, sr., forward. COACH: Mike Soucy, eighth season. LAST YEAR: 14-4, lost in first round of Division II tournament. RETURNING STARTERS: Shea Whalen, sr., forward; Logan Blake, sr., forward; Cole Gallant, sr., guard. OTHER RETURNING PLAYERS: Daniel Bentall, sr., guard; Ryan Papineau, sr., forward; Jason Van Coughnett, sr., guard; John Beckett, sr., forward; Conor O’Shea, sr., guard; Matt Fothergill, jr., guard. PROMISING NEWCOMERS: Nick Fothergill,fr., guard; Will Petersen, so., guard; Riley Hamel, jr., guard; Trevor Bowler, jr., forward; Patch Zorn, jr., forward. LAST SEASON: Fifth in Division II meet. RETURNING SWIMMERS: Matt Falcone, jr.; Austin McCalmont, jr.; Tom Regan, sr.; Jacob Solon, sr.; Tyler O’Brien, sr. PROMISING NEWCOMERS: Amit Eshed, fr. ; Cam Jackson, so. ; Vivek Nithipalan, fr. COACH’S COMMENTS: “We’ve got a good nucleus of returning guys,” Ouellette said. “Our relays should be strong and our newcomers should add depth. RETURNING SWIMMERS: Sadie Solon, so. ; Noam Eshed, sr.; Nicole Hall, so. Fiona Kennedy, sr.; Tess Meagher, so. ; Ambica Gupta, jr. PROMISING NEWCOMERS: Kelly MacFarlane, fr. ; Morgan MacMillan, fr. ; Siobhan Rogers, fr. Opening night for any sports team tends to offer up plenty of questions regarding the team’s ability. The Bedford High School wrestling team got all the answers it wanted, utilizing five pins in Wednesday night’s 48-21 season-opening win over Alvirne High School. The Bulldogs buried the Broncos early on with pins in three of the first four matches courtesy of Ben Gilman (138 pounds), Josh Belz (145) and Justin Mello (160) to jump out to a 21-0 lead. With his team in need of a confidence boost, Ray Hamelin claimed the first points for Alvirne in the dramatic 170-pound match. Hamelin had as much as a 9-4 advantage over counterpart Ben Miller, but Miller came roaring back when he rolled over on top of Hamelin to even the score. After holding off Miller in the final 12 seconds of the third round, Hamelin wasted no time by clamping his adversary down on the mat to claim the 11-9 win. The surging win laid the ground for 182-pounder Evan Manning’s pin on Ryan Belz in the very next match bringing the score to 21-9, but that was the extent of the Broncos’ success. Alvirne’s ensuing points came from an unopposed win at the 182-pound class and 120-pounder Nick Milinazzo’s pin in 1 minute, 56 seconds over Jake Valeri. Bedford’s Ben Gilman pinned John Plante in the first match. The second match saw Josh Belz with a pin over Alvirne’s Eaon Welchin. The third was a 10-6 win by Bedford’s Chris Conery over Trystian Davio at 152 pounds. The fourth was a pin by Justin Mello over Alvirne’s Jacob Lavalley. The fifth saw Hamelin 11-9 over Miller. The sixth was Manning’s pin on Belz. Alvirne’s Jacob Rice (182) and Bedford’s Matt Houston (195) were both unopposed. The ninth match had Robert Lamy’s 1:06 pin on Alvirne’s Cole Sevigny at 285 pounds. Jake Hall (106) was unopposed for Bedford. Bedford’s Ben Dow had a 6-4 win over Taylor Thyne in the 120-pound match. The 12th match was Milinazzo’s pin on Valeri, followed by Bedford’s Colin Perras pinning Ben Katsohis to close things out. Bedford (1-0) travels to Litchfield on Saturday to face Campbell, while the Broncos (0-1) will host Spaulding on Dec 18. It doesn’t matter when the game is being played, Eric Gendron knows when he needs to take a game over. The Merrimack High School senior scored nine of his 32 points in the fourth quarter Friday night, helping to Tomahawks go on an 11-0 run to turn a deficit into a 68-58 win over Pelham in the last game of the Coaches For A Cause Jamboree at Alvirne High School. Gendron made four of Merrimack’s 10 3-pointers, while Shayne Bourque added 16 points (two 3s) and Austin Franzen had 12 points, all on 3s. Pelham got 22 points from sophomore Keith Brown, while Jake Vaiknoras added 16 points, as the Pythons scored just six points in the game’s final eight minutes. Merrimack trailed most of the first half, but went on a 9-2 run midway through the third quarter to take its largest lead of the game to that point, 44-39. But the Pythons went on a run of their own, finishing the quarter by outscoring the Tomahawks 11-6 to lead 52-50 after 24 minutes. Gendron opened the fourth by scoring Merrimack’s first five points while Franzen added a 3 and Bourque scored to put the Tomahawks up 61-52.